While GiftProse specializes in providing you with incredible gifts that you can give to others, there is no rule that says you can't give certain gifts to yourself. Our collection of individual gourmet desserts are so insanely delicious that you just might want to keep them all to yourself. 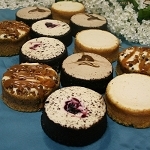 The assorted mini cheesecakes package brings the richness of real eggs and 100% cream cheese, with ultra-tasty flavors like the pecan and caramel Turtle cheesecake, the cherry-swirled Black Forest and the Cappuccino variety. When you need to get your chocolate fix, our Chocolate Saucy Cakes are bakery quality, with a molten core of chocolatey goodness and topped with ganache, brownie chunks, caramel and more. They go from freezer to microwave to being devoured in less than a minute, making them super convenient for after-meal desserts and late night snacks. If you're really nice, you can give a six or twelve pack of these individual gourmet desserts as a gift to someone you really like, but go ahead and order one for yourself while you're at it.